One of my favorite annual events is Oishi's Snacktacular. They beat themselves every year, and I am amazed with all the concepts they come up with to provide something new for their fans! From Glorietta to Trinoma, this year their venue of choice is SM Mall of Asia's Music Hall. 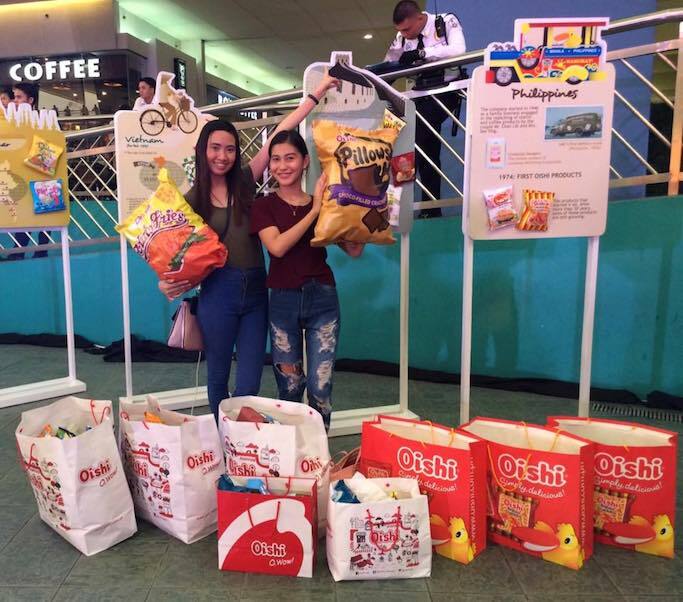 As always, Oishi Snacktacular is a blockbuster! Enter the 8-bit inspired venue for FREE. Play the games at minimal cost, and get to take home BAGS AND BAGS of Oishi Snacks! Just like my dearest Twitter friend @ssenmendoza! O, WOW talaga! And fellow blogger @rochellemiko!!! Hakot yan a! There are different stations that you can participate in at the Oishi Snacktacular. It's a fun weekend activity with your family or barkada. Sa libre muna tayo, haha! Pak! Ganern! Haha, este, Pack & Pose at the huge Oishi photo booth! Our version, haha! PS: Vegetarian po ako, hahaha! Kaya favorite ko ang Martys! Oishi World of O, Wow! Awesome awesome concept! Oishi World of O, Wow! features the different Oishi snacks available around the world! Got to try a few of these exclusive treats at the event! Swim and catch as many Oishi chips as you can, for only Php 200! Because of the long line, I wasn't able to conquer the Snack Catcher again this year (or dyahe lang ako, haha!)... But I heard that my blogger friend @rodelflordeliz broke the record, and caught 121 packs!!! Choose two types of chips and two flavors, and create your own Oishi snack on the spot for only Php 20! My Potato Fries + Ridges Potato Chip with Wasabi + Nori! Super love this, my favorite Choco Chug drink turned into ice cream for only Php 20! Plus, you can choose 2 free toppings (my favorites are Sponge and Pillows!). My favorite Oishi Smart C+ drink turned into shake - perfect for the weather! Calamansi o Pomelo? Avail this for only Php 20! My favorite! At Php 100 only, get to wear Oishi Cuckoo Bird's costume, and try to catch as many pingpong balls as you can! Get to take home a bag of snacks according to the points you earned! Another crowd favorite! For Php 295, fill your giant 2 ft Oishi bag with as many snacks as you can in one minute! I filled mine with Oishi Gourmet Picks! And lastly, get to meet Oishi's star-studded pool of endorsers! Yesterday, they had Ramon Bautista, Alex Gonzaga, Slater Young, and of course KathNiel's Kathryn Bernardo and Daniel Padilla! For complete event and booth mechanics, visit THIS PAGE. Follow Oishi on Facebook, Twitter @oishi_tweets, and Instagram @oishiph. Super fun! :) init Lang haha!